Facebook announced today that it is adding a feature called "Why am I seeing this post?" to News Feeds. 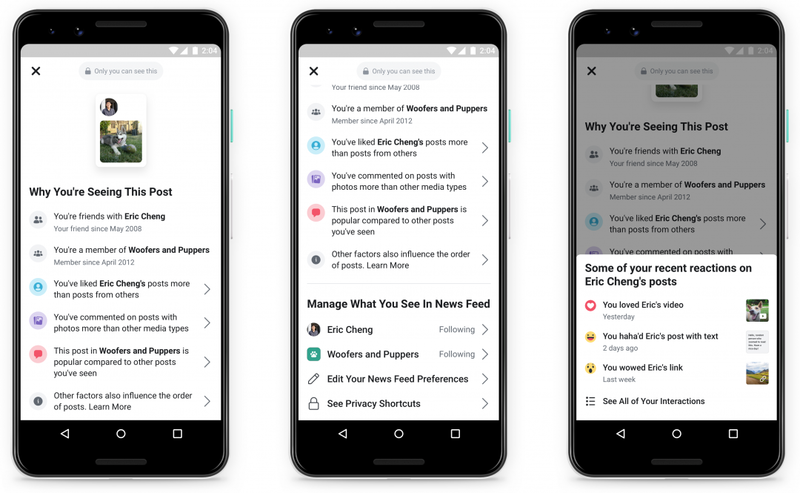 Similar to "Why am I seeing this ad?," which has appeared next to advertisements since 2014, the new tool has a dropdown menu that gives users information about why that post appeared in their News Feed, along with links to personalization controls. Meant to give users more transparency into how Facebook's News Feed algorithm works, the update comes as the company copes with several major events that have highlighted the platform's shortcomings, including potentially harmful ones. These include its role in enabling the dissemination of a video taken during the shooting attacks on New Zealand mosques two weeks ago, which were originally broadcast using Facebook Live; a lawsuit filed by the U.S. Department of Housing and Urban Development that accuses Facebook's ad-targeting tool of violating the Fair Housing Act and its role in spreading misinformation and propaganda (after years of complaints and criticism, Facebook recently announced plans to downrank anti-vaccination posts and ban white nationalist content. Why you're seeing a certain post in your News Feed - for example, if the post is from a friend you made, a Group you joined, or a Page you followed. The same menu will also include links to personalization options, including See First, Unfollow, News Feed Preferences and Privacy Shortcuts. The company's blog post said that "during our research on 'Why am I seeing this post?,' people told us that transparency into News Feed algorithms wasn't enough without corresponding controls." "Why am I seeing this ad," a similar feature that launched in 2014, will be updated with to include more information. For example, it will tell users if an ad appeared in their News Feed because a company uploaded their contact lists, like emails or phone numbers, or if they worked with a marketing partner to place the ad.